Years ago we had a short encounter with Valencia and we instantly knew that we had to go back some day. 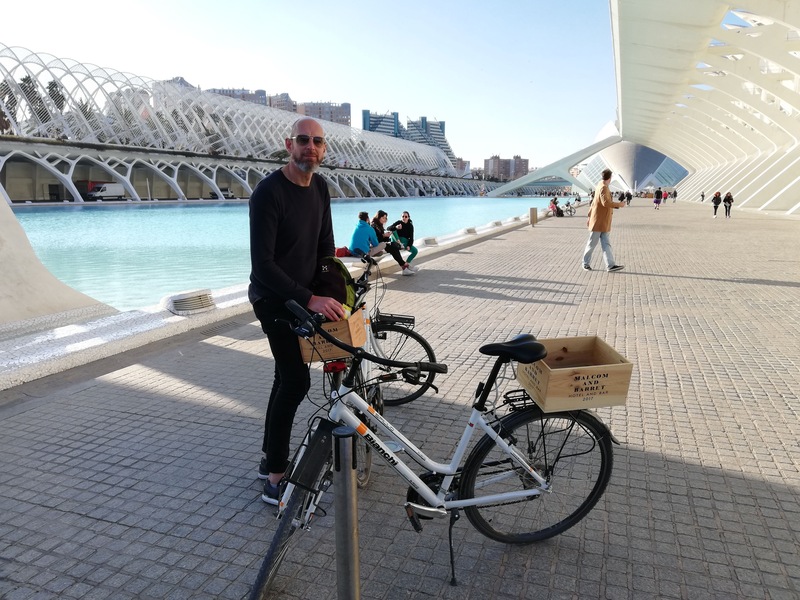 In the winter of 2019 we finally had the opportunity to dig deeper into this absolutely amazing city, the third largest in Spain. When traveling in southern Europe you are pampered with picturesque towns exuding medieval charm, imposing gothic buildings, magnificent churches and cathedrals, impressive squares and exciting ancient history and Valencia is no exception. 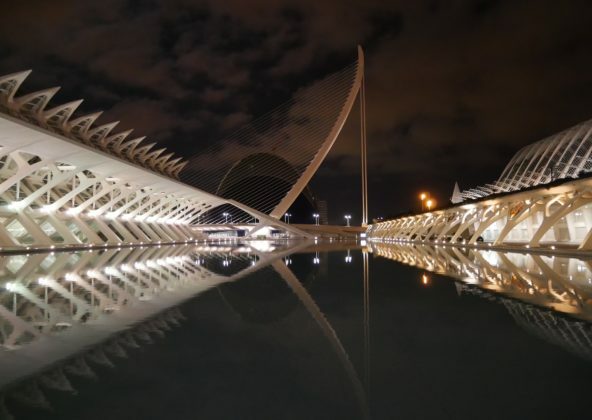 But what really makes this Spanish metropole something extraordinary and what will make your jaw drop is La Ciudad de las Artes y las Ciencias, The City of Arts and Sciences. 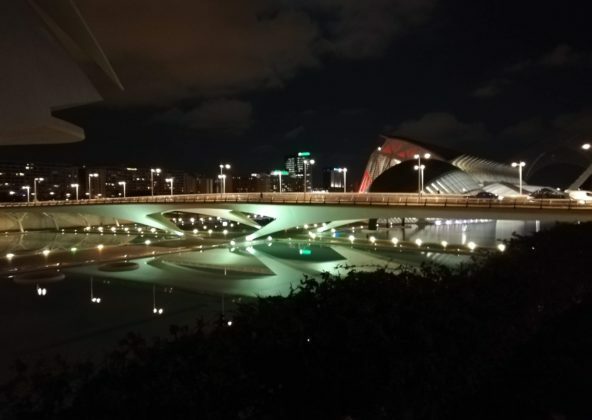 A futuristic mirage constructed in the dried out riverbed of the former Turia river. 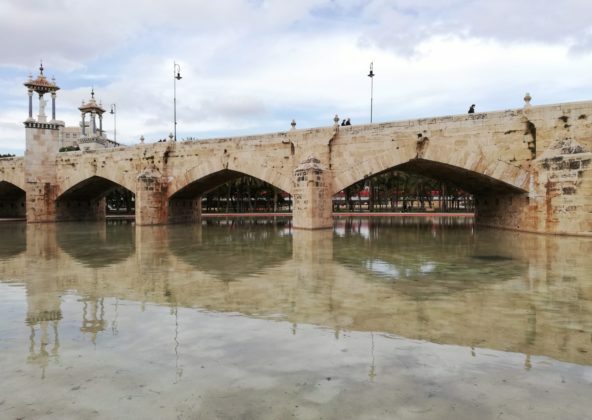 For centuries the people of Valencia struggled with flooding from the mighty Turia river and after a devastating flood in 1957, that flooded almost three quarters of the city and killed over 60 people, a diversion project was devised. The river was divided in two. During floods the water is diverted southwards along a new course that skirts the city. 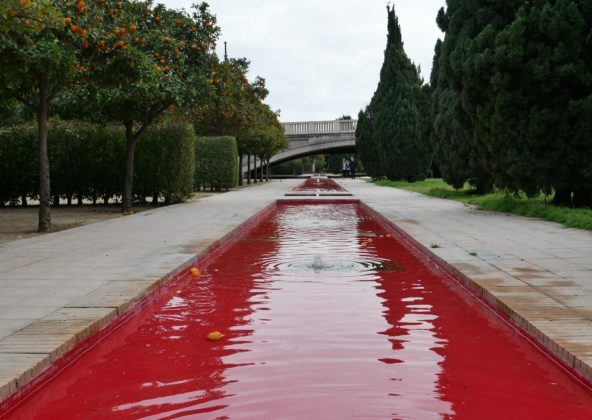 After the diversion the city leadership planned for a highway in the old riverbed. 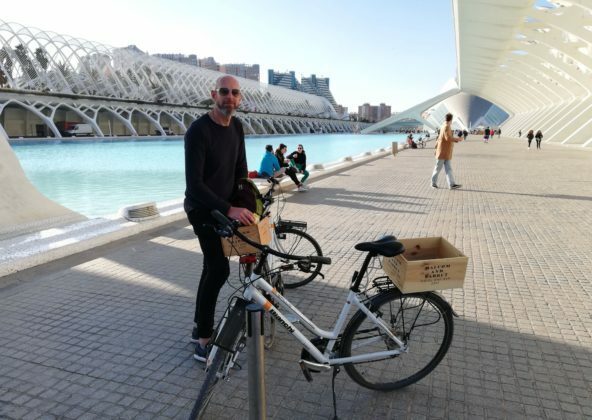 But the people of Valencia pushed back and protested the highway proposal under the motto ” The bed of the Turia is ours and we want it green”. 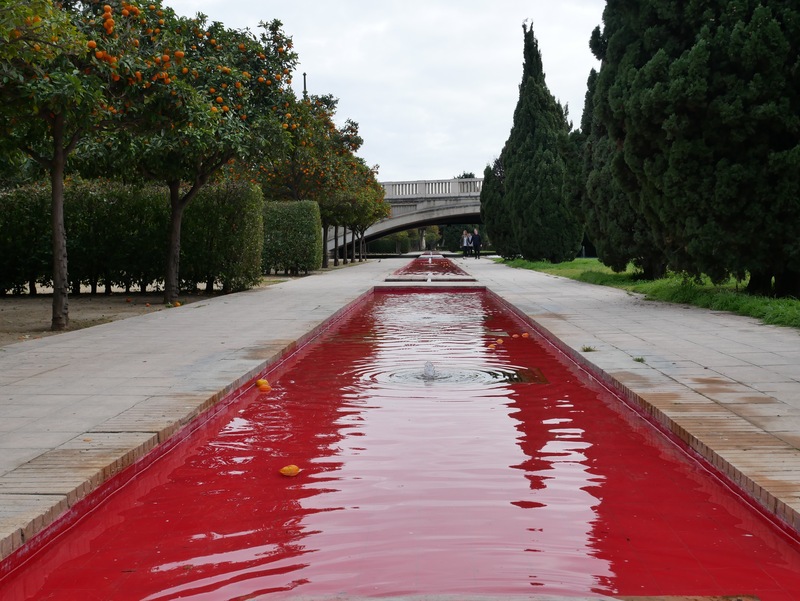 Luckily the people won and the City approved legislation to turn the riverbed into a park. 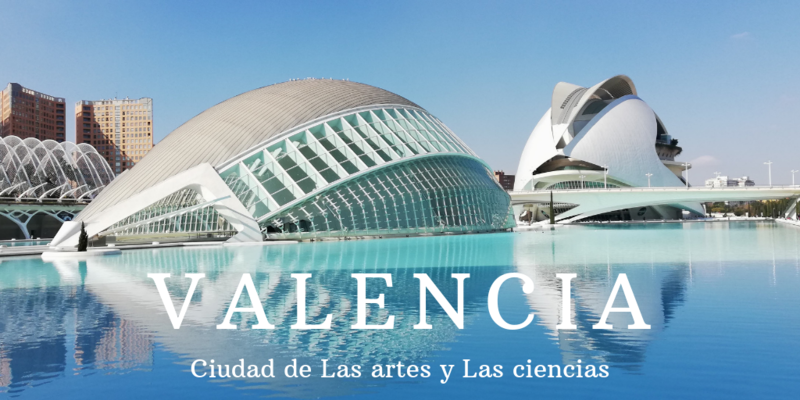 A decision that forever changed the city of Valencia. 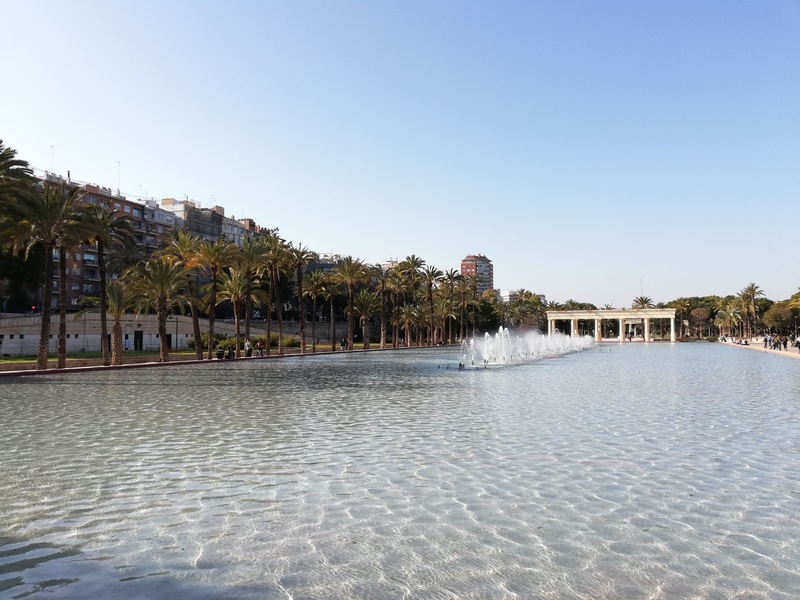 Today the Turia Gardens wind like a giant five-mile long green snake through the city. The park comprises over 450 acres and is a recreational masterpiece for the benefit of the citizens and its guests. The gardens are a heaven for bikers, runners, hikers, walkers, skaters, lovers, strollers, old and young. 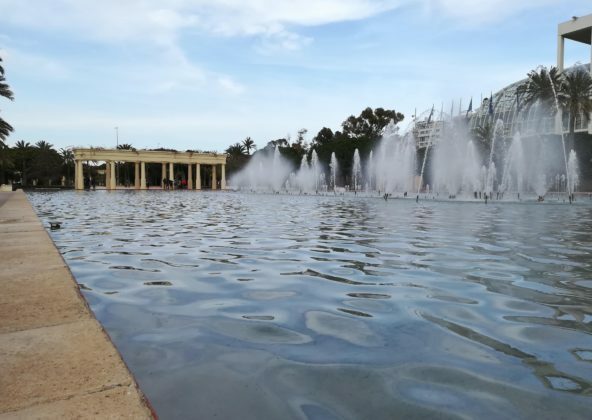 It is possible you should do the almost 9 kilometer long walk from the Bioparc in the west to the Arts and Science city in the east. Each section of the park has its own expression and its own charm. 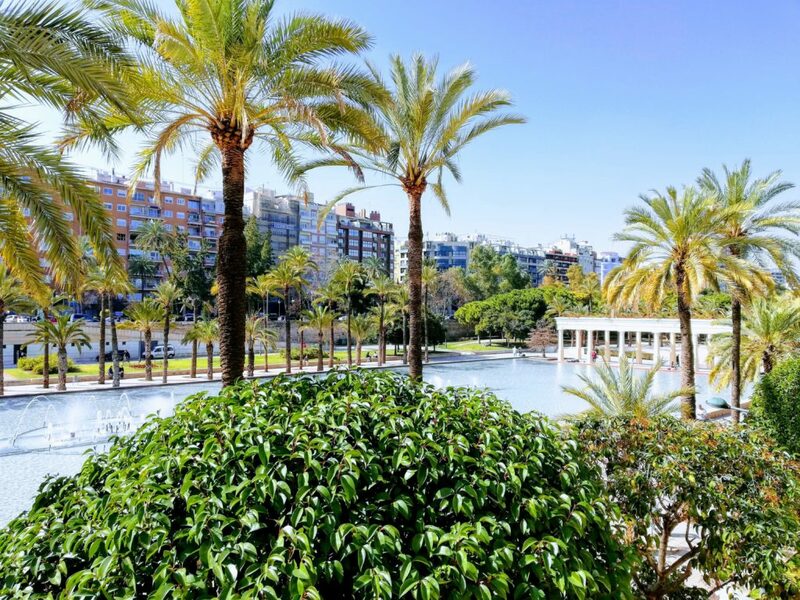 Each section of the mighty Turia Gardens has its own charm and expression. 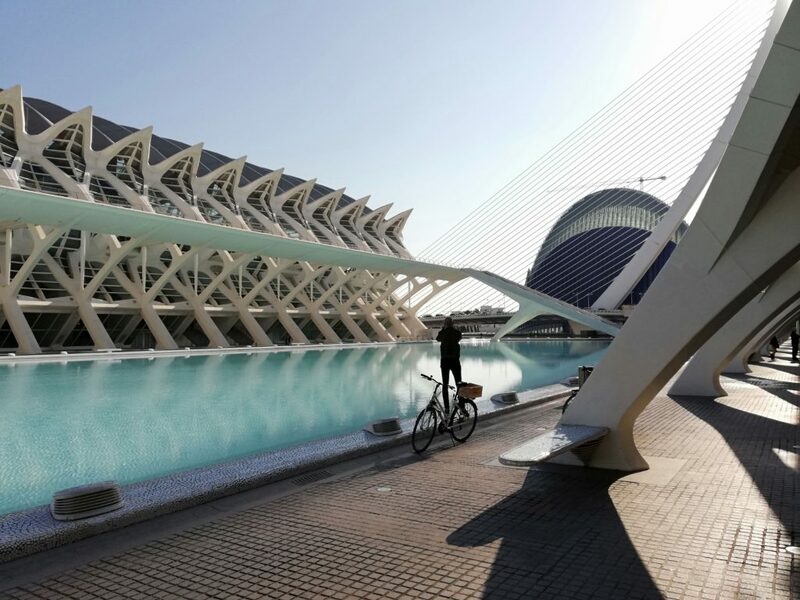 At the very end you will be rewarded with the absolutely amazing and stunning Ciudad de las Artes y las Ciencias (CAC). 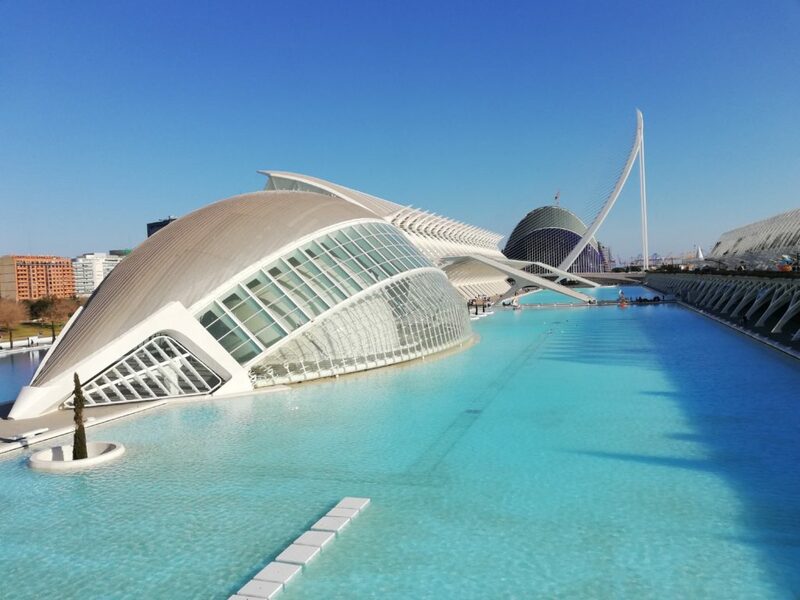 It is almost as if the amazing futuristic buildings of the City of Arts and Science float on the crystal clear water in the pools that surround the complex. 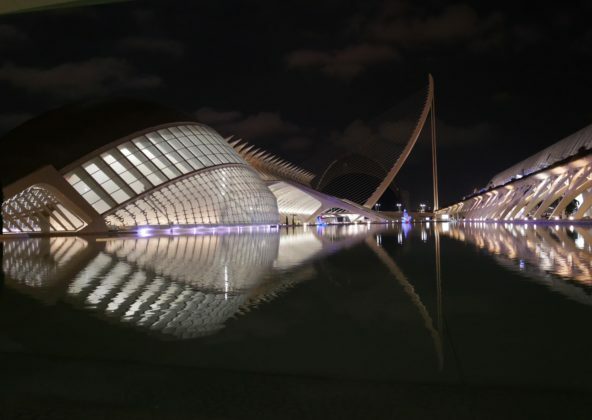 The CAC is designed by the world-renowned Valencia born architect Santiago Calatrava. 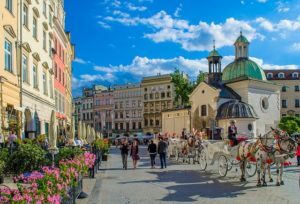 It is considered to to be one of the 12 treasures of Spain along with for-instance the Cathedral in Seville, La Sagrada Familia in Barcelona and the Guggenheim Museum in Bilbao and we certainly get why. This futuristic beautiful entertainment-based cultural and architectural complex will wow and amaze you in a way you will never forget. 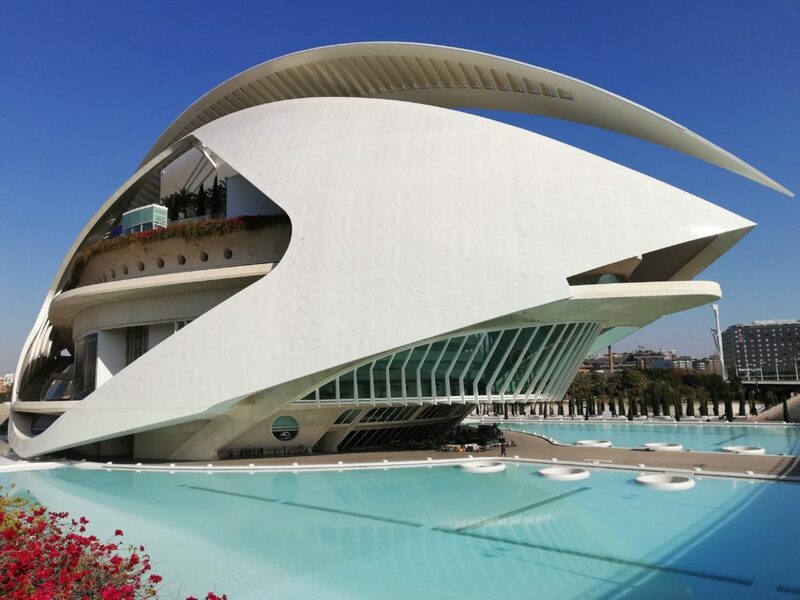 When the Valencia Opera House was official opened in 2005 it was the culmination of 14 year’s of work for the architect Calatrava. We find the building to be somewhat of a masterpiece in modern architecture. Walking around this absolutely out of this world futuristic building gave us goose bumps more than once. We discussed whether the building resembles a seagoing vessel or a spacecraft. 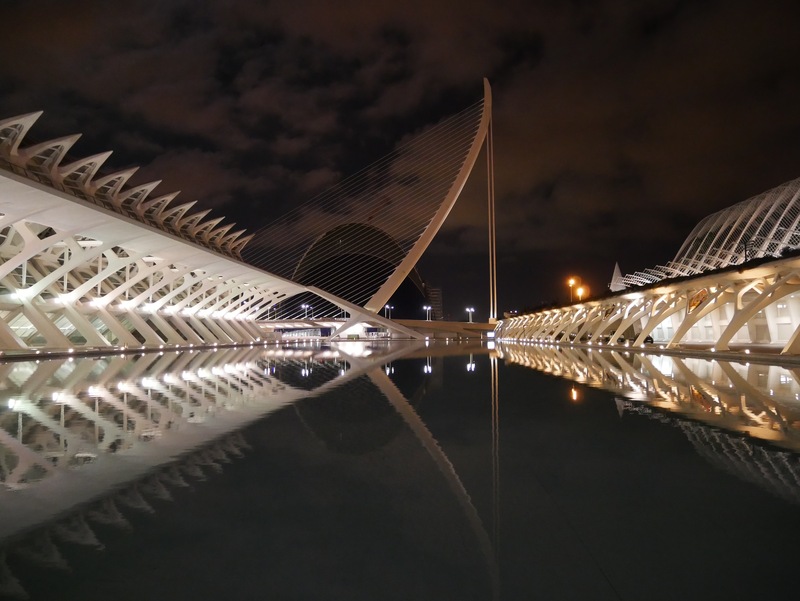 But in fact, Calatrava had a prehistoric giant warrior’s helmet in his mind when designing the building. 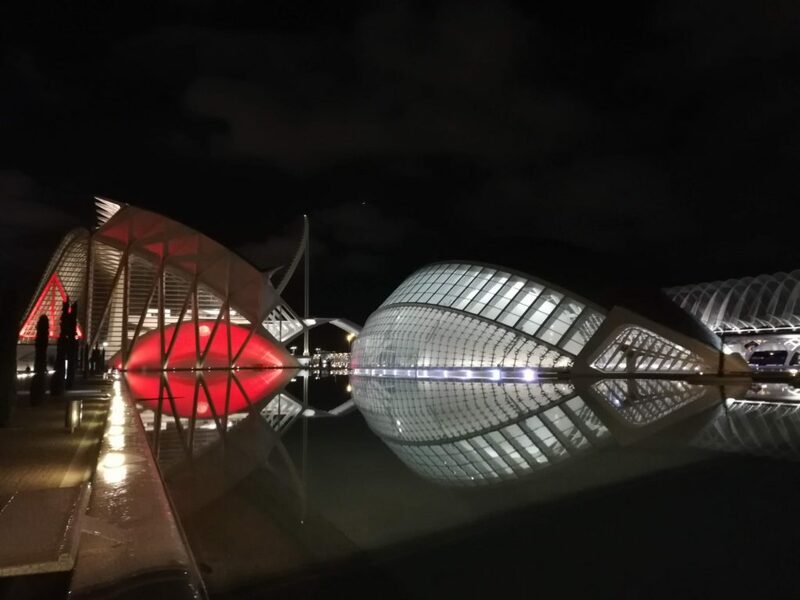 This stunning iconic construction will no doubt become a symbol of the city of Valencia just as the Opera House has become for Sydney. The Opera House has so many beautiful details. For instance like this door handle. 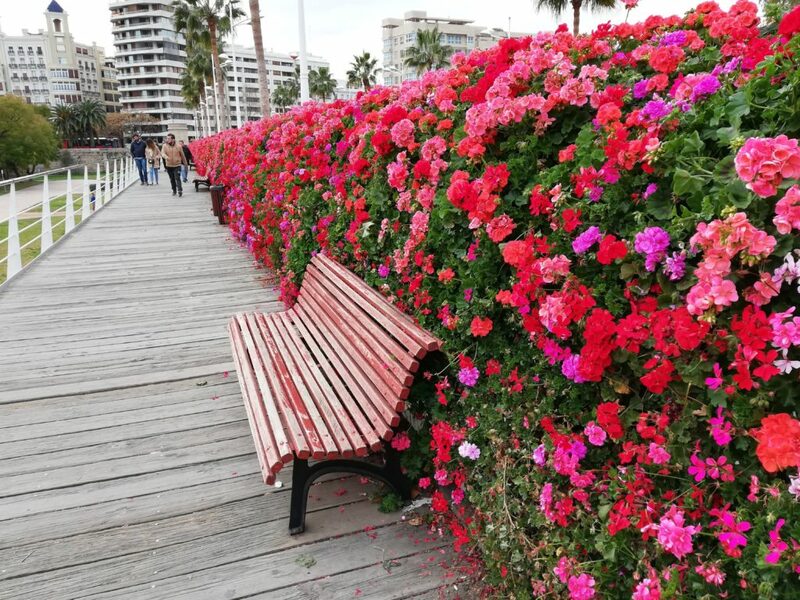 Keep your eyes open during your visit and you will be rewarded with many surprising quirks. The Opera House extends over more than 55,000 square meters and measures more than 70 meters in height. 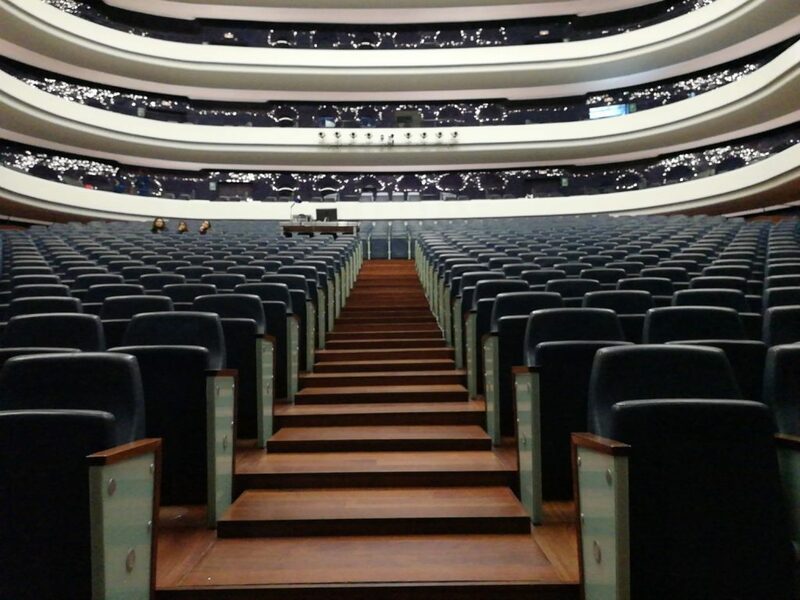 The building holds 4 separate halls and can seat more than 4000 spectators. We recommend you to take one of the very informative guided tours. 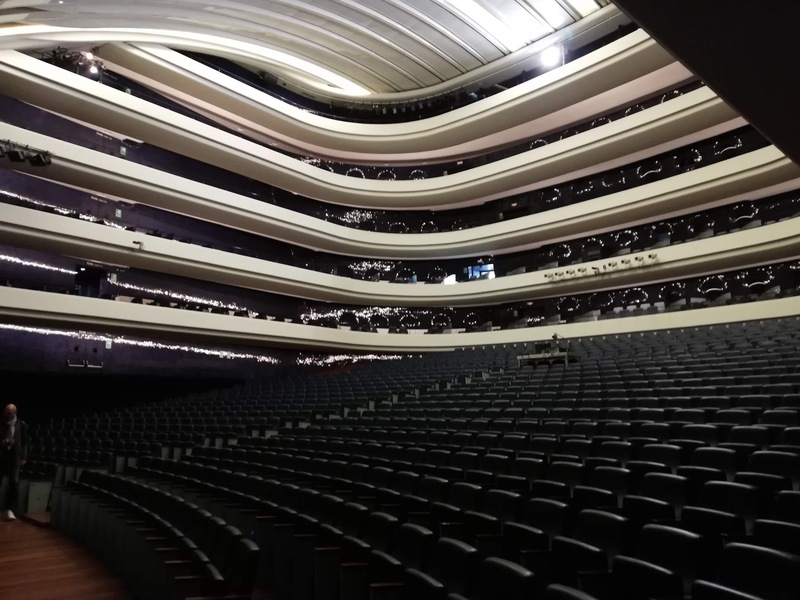 The concert hall, which seats more than 1400 guests, principally serves as an opera house. 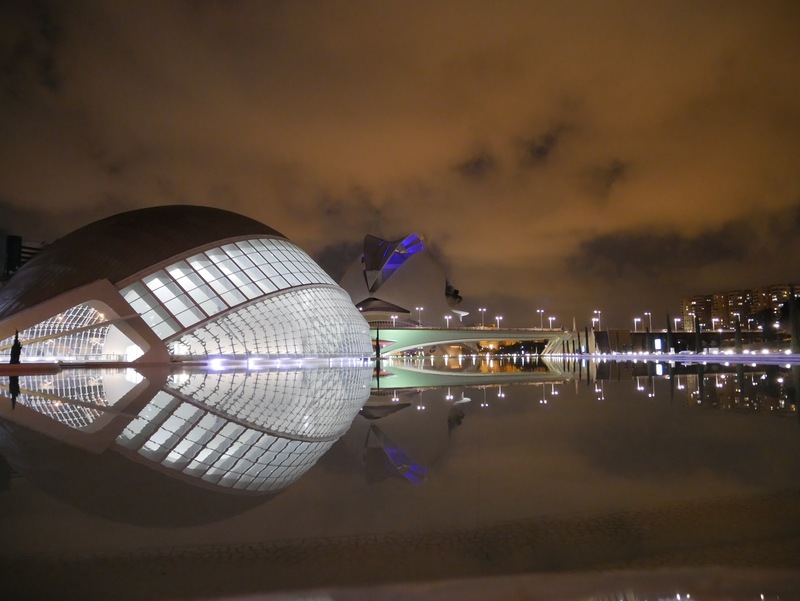 The beautiful planetarium and IMAX Cinema is meant to resemble a giant eye. 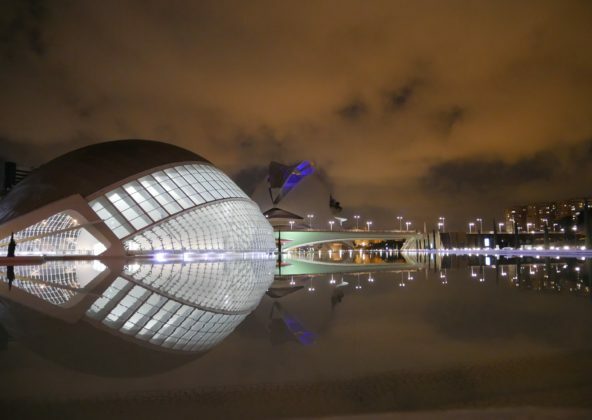 Like the Opera House it is almost like the “Eye of knowledge” floats on a surface of water. 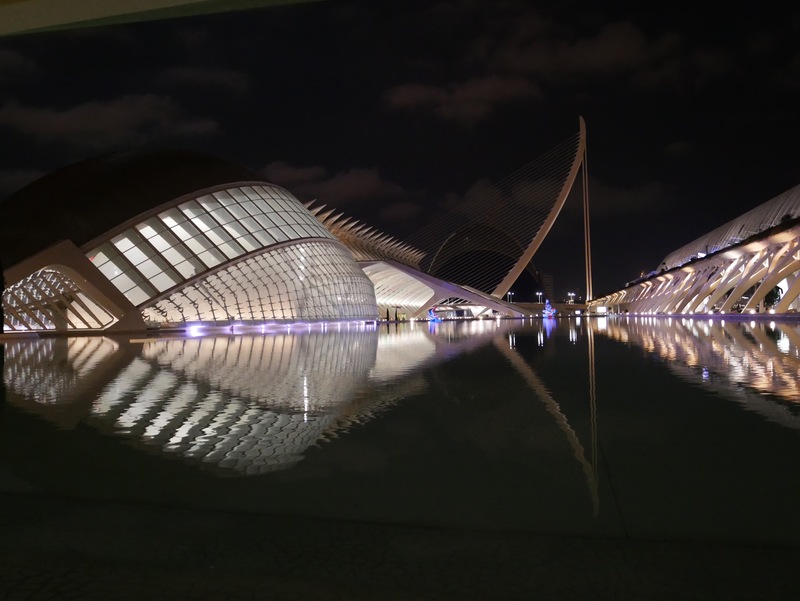 The Hemisferic was the first building of the CAC and also designed by Calatrava. 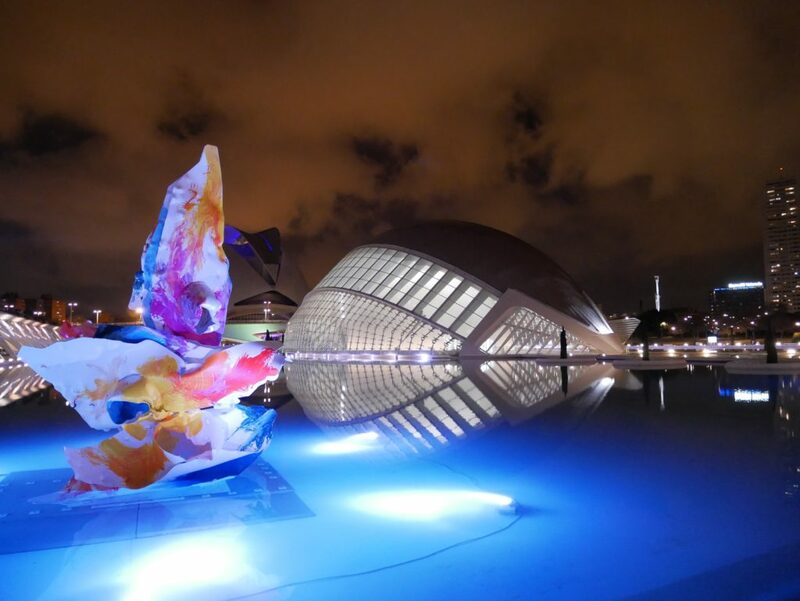 Do try to visit the CAC day and night. The lighting is spectacular. It’s a great and thrilling experience to join in on one of the many different IMAX movies displayed on the 900 square meters large screen. 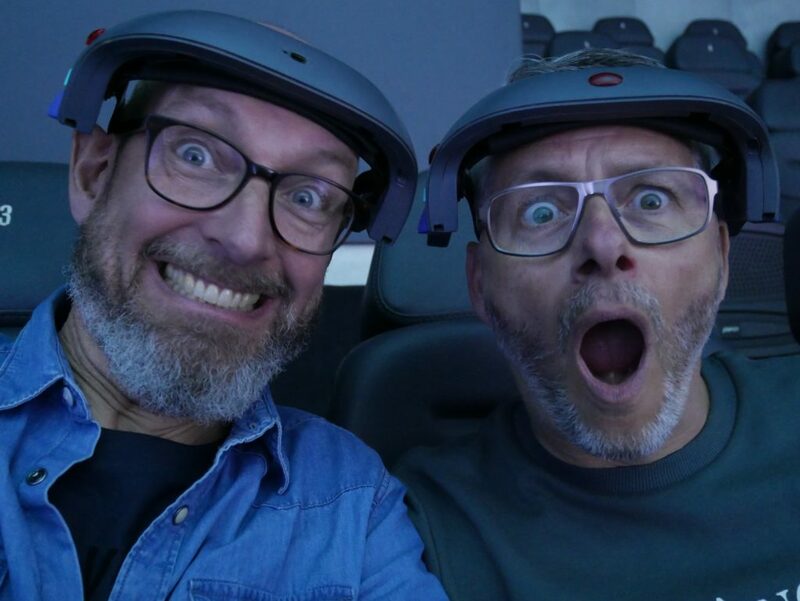 Join in on one of the many shows in the IMAX theatre in L´Hemisferic. You will be thrilled. 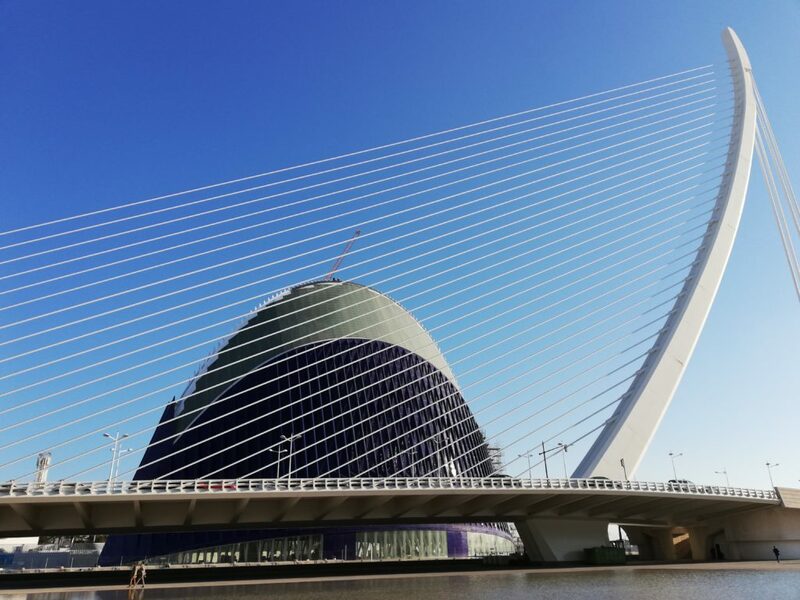 This monumental building is an interactive museum of science and resembles the giant skeleton of a whale. 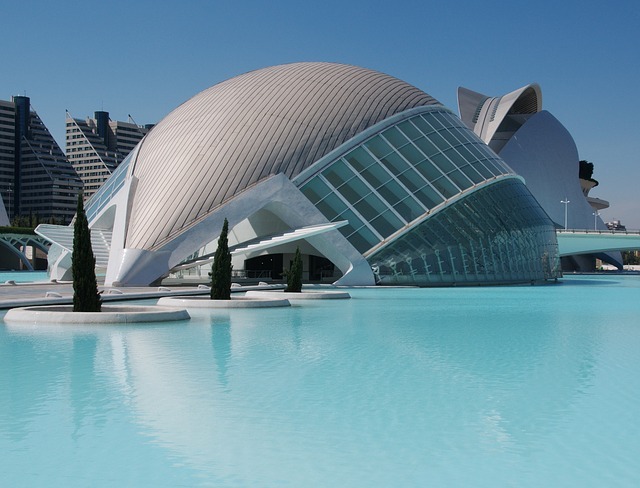 This grand building occupies more than 40000 square meters and is currently the largest exhibition space in Spain. The science museum’s main objective is to stimulate curiosity and critical thinking. Full interactivity is one of the special features. The motto of which is “Forbidden not to touch, not to feel, not to think”. 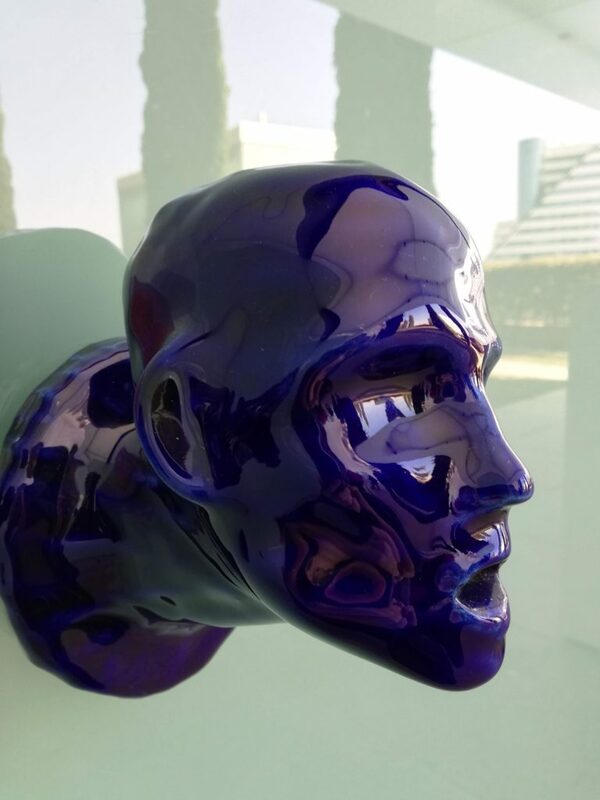 You can easily spend hours in this state of the art museum. This beautiful building was originally designed as an entrance to CAC. It is 320 meters long, 60 meters wide and 18 meters high. 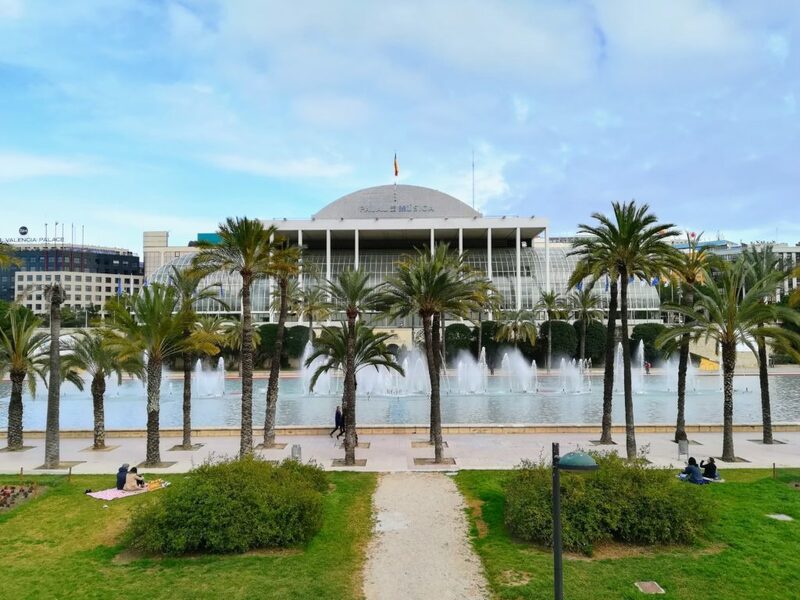 It harbours in its interior an outdoor art gallery with sculptures by contemporary artists and a botanical garden with plants indigenous to Valencia. 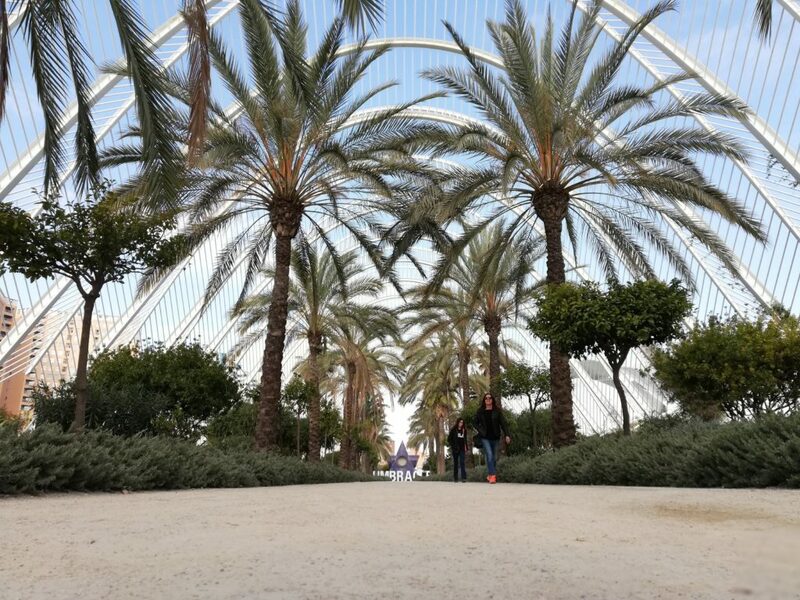 Along the central arch of the building, you will find 99 majestic palm trees, planted as a beautiful contrast to the featherlight construction. 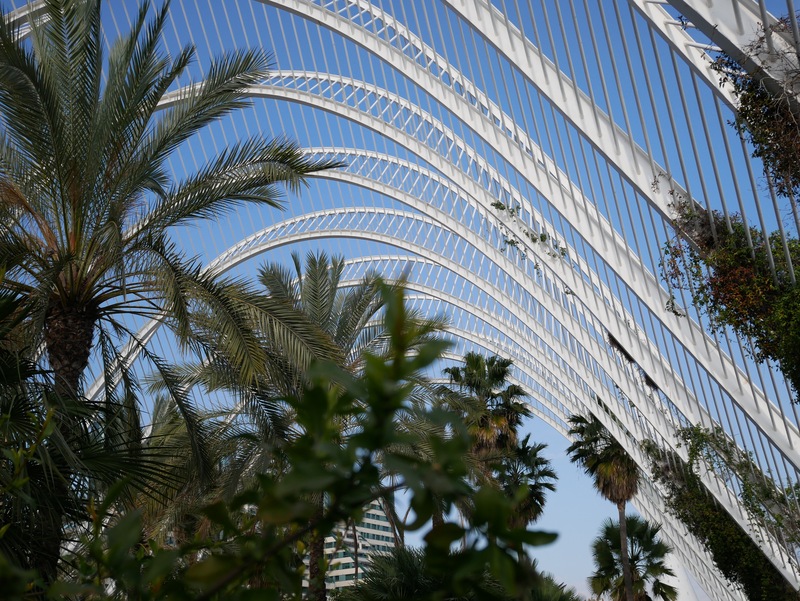 In summer, one end of the L’Umbracle is converted into a large open-air nightclub. Here you can dance till the early hours and sip ice cold cava and Aqua de Valencia. The most recent of the buildings in the CAC. Inaugurated in 2009. These days the Agora is undergoing a major renovation but it is still very impressive and beautiful. 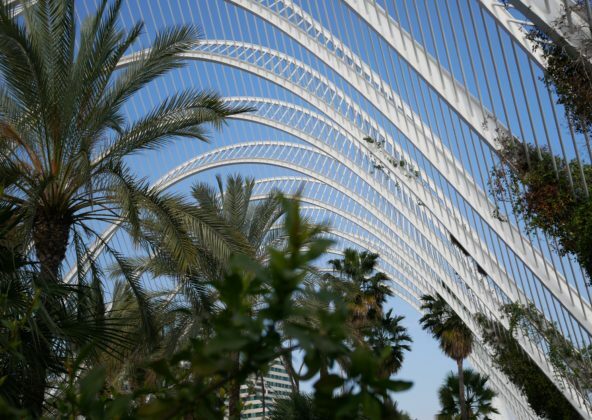 The Agora is also designed by Calatrava and is a multifunctional covered space. It can seat a maximum of more than 6000 guests and is designed to hold events such as concerts, performances, exhibitions and international sports performances. These days the construction is undergoing a major renovation. 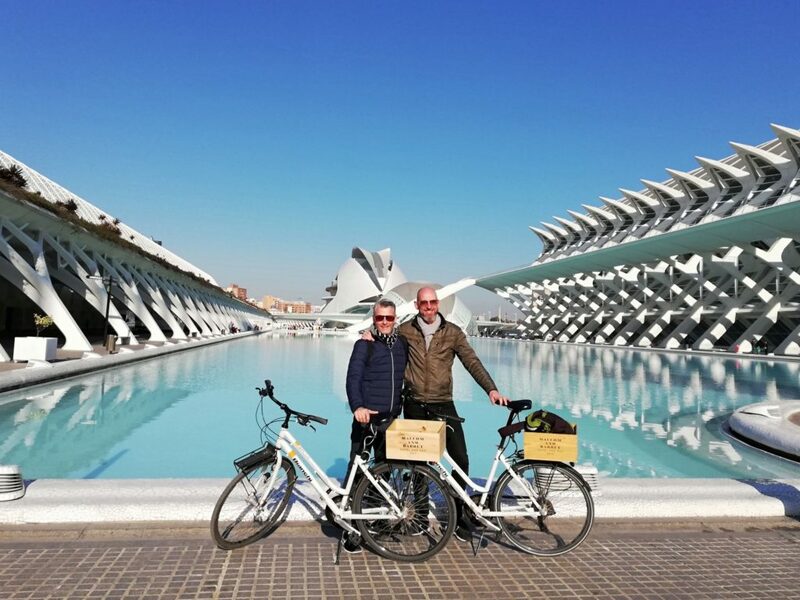 We spend several days wandering and biking through the mesmerizing complex of La Ciudad de las Artes y las Ciencias. We simply couldn’t get enough. Its hard work exploring the vast grounds of the CAC. 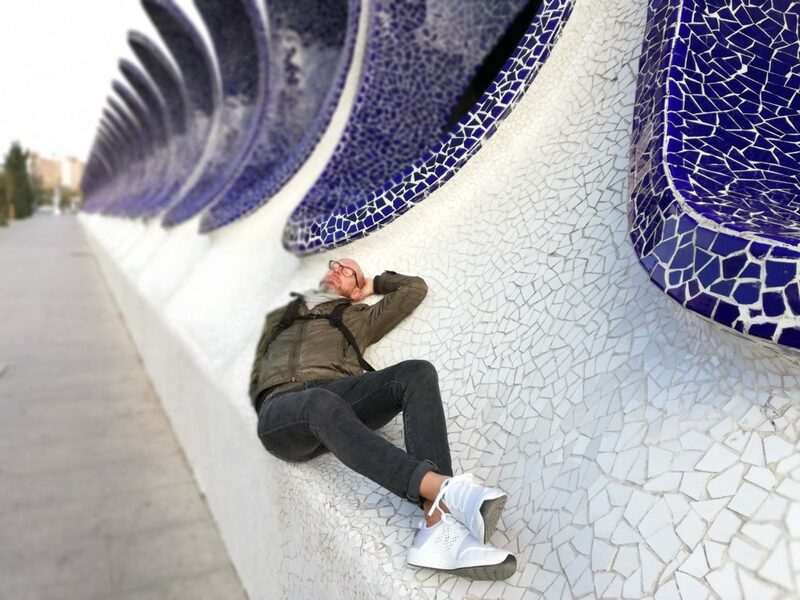 Luckily there are many places where you can have a little nap. When we thought we had seen it all we discovered something new and exciting. 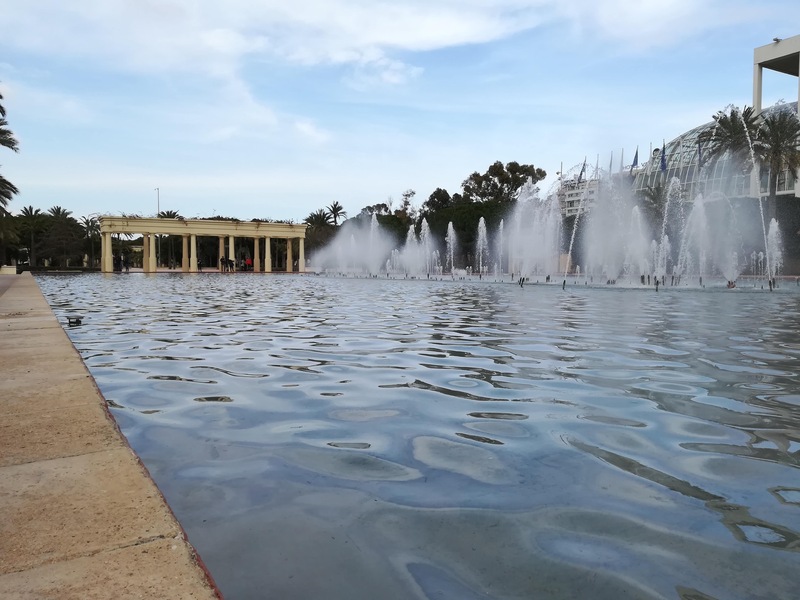 The complex is stunning and breathtaking in daylight but maybe even more, if possible, during night, when all the buildings and the pools are lit a the most spectacular and dramatic way. 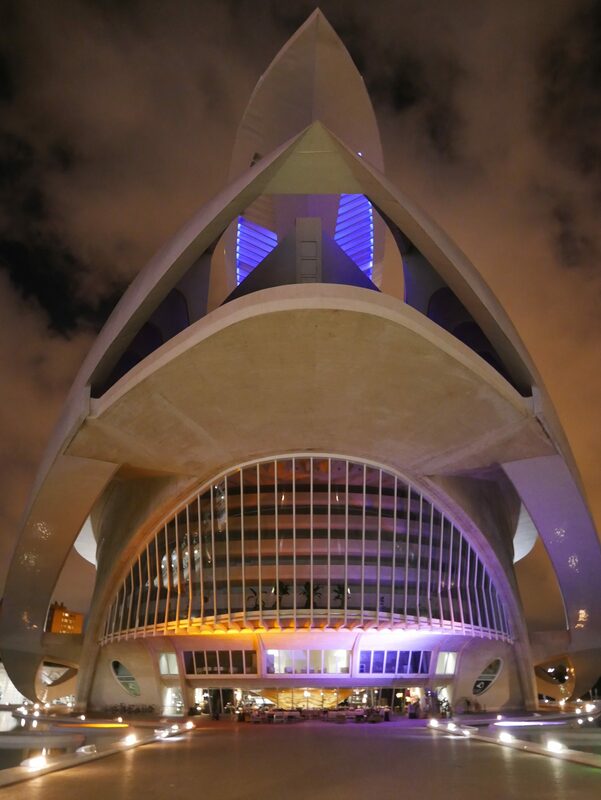 We give the futuristic City of Arts and Science our warmest recommendations. 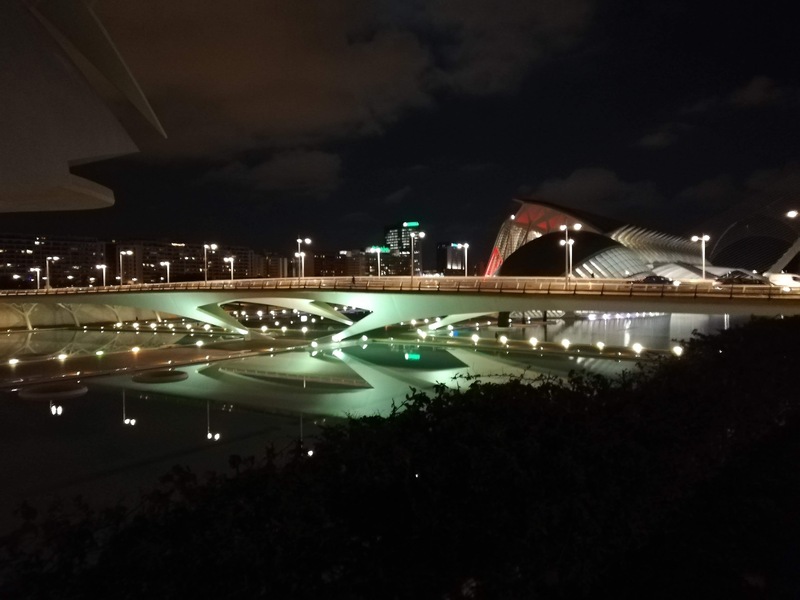 Visiting the CAC in the evening gives you a completely different experience. Do visit CAC in daylight and also in the evening. The light-setting is stunning. Eat lunch at the Palau de la musica. 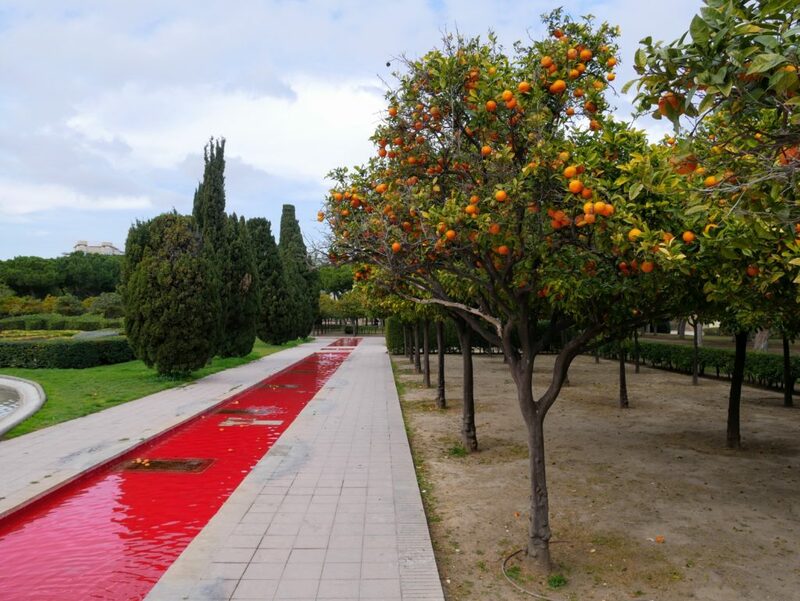 Situated in the Turia gardens close to CAC. They have a quiet​ garden where they serve delicious food and wine at a very reasonable price. 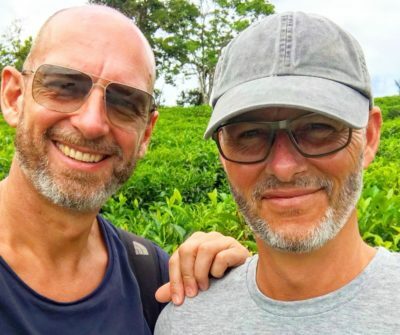 Gallery – just enjoy or click to go to next image.